The Screaming Penny: Groupon: Two Personalized 12-month Calendars from Shutterfly for only $20! Groupon: Two Personalized 12-month Calendars from Shutterfly for only $20! Today’s Groupon for the city of Phoenix is an online deal that anyone can take advantage of. The Phoenix Groupon is for Shutterfly. 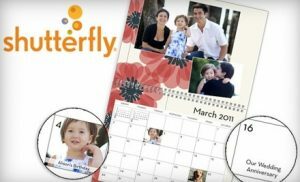 You can get 2 Personalized 12-month calendars from Shutterfly for only $20. Customize your calendar with photos and text! You can even add text and photos to the calendar days. We've made these before and really like Shutterfly's quality. The Fine Print: Expires 2/15/11. Limit 1 per person. Valid for two 12 month calendars only. Must us in full in one order. Not valid for desk calendars or calendar posters. Tax, shipping & handling not included. thanks, MojoSavings.